A New York City designer shares secrets to making a small bath both functional and beautiful. 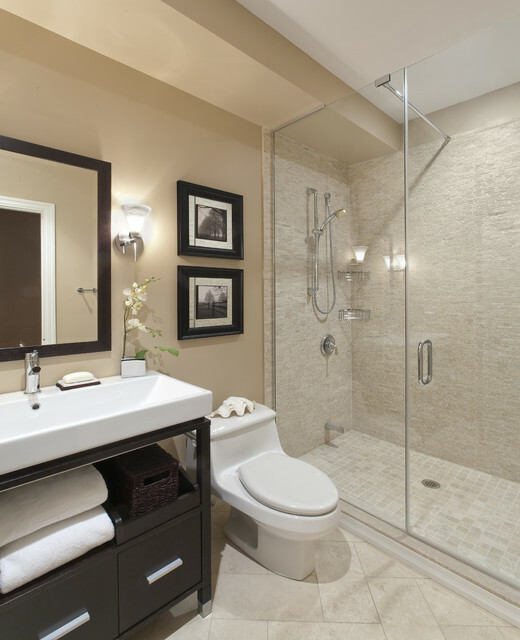 Got a small bathroom to renovate? Go wild with texture and colors if it’s a rarely used guest bath, but stick to clean and simple in a master bath. That’s the word from designer Jamie Gibbs, who transforms incredibly small New York City bathrooms into beautiful spaces. “I liked being shocked by details in a little space, especially if it’s not going to be used much,” Gibbs says. 1. Avoid textures in bathrooms that get daily use. In a heavily used bathroom, anything with texture becomes a collection spot for mold, mildew, and toothpaste. Say no to carved vessel sinks or floor tile with indentations. 2. Be careful with no-enclosure showers with drains right in the floor. These Euro showers allow for a feeling of openness, but the average American contractor doesn’t know how to waterproof the floor for them, Gibbs says. The tile seals can be compromised if not installed correctly, causing the materials to decompose, and water to leak underneath. 3. Use opaque windows and skylights to let light filter into all parts of the bath. A long skinny window with frosted glass means you don't have to burn high-wattage light bulbs. Make sure water condensation will roll off the window into an appropriate place (i.e. not the framing or the wall) to avoid future maintenance issues. 4. Look for fixtures that have a single handle rather than separate hot and cold taps. “Space-saving gearshift faucets are a very good choice in small bathrooms,” says Gibbs. You’ll also save money by not having to drill holes in the countertop for the hot and cold taps. 5. Save space with wall-mounted toilets and bidets, but be aware that the water tank goes into the wall. That’s fine if space is such a premium that you won’t mind going into the wall to make any repairs. But if you share a wall with a neighbor, that's a different issue. 6. Use a wall-mount faucet to make a reduced-depth vanity work in a small space. “I can get away with a 22” vanity instead of a 24” vanity with a wall mount faucet,” Gibbs says. 7. Check the space between the handles and the faucet of any space-saving fixtures. “If you can only get a toothbrush in it to clean, you'll save space, but it’s functionally stupid,” Gibbs says. Make sure the sink is functional, too. If you’re using a vessel sink, make sure it’s large enough and not too high. “If it’s too high, you'll knock it so many times that the fittings will come loose,” Gibbs says. 8. A pedestal sink is all form and no function. “It’s a great-looking sink, but there’s no place to [set] anything,” Gibbs says. 9. Wall-mounted vanities seem like they’re space savers, but they create dead space between the vanity and the floor — a space that often accumulates junk and never gets cleaned. 10. If you're comfortable with it, go European and put up a glass walls between the bathroom and bedroom to create the illusion of space. Or put bathroom fixtures in the bedroom just outside the bath.